The TrueGivers Data Hygiene and Enhancement Integration was created to keep your database updated automatically with Mailable Addresses, Deceased Information, and Individual & Household data enhancement. We provide the easiest way to keep your CRM data clean & up-to-date - Automatically. The process is streamlined and easy to set up. 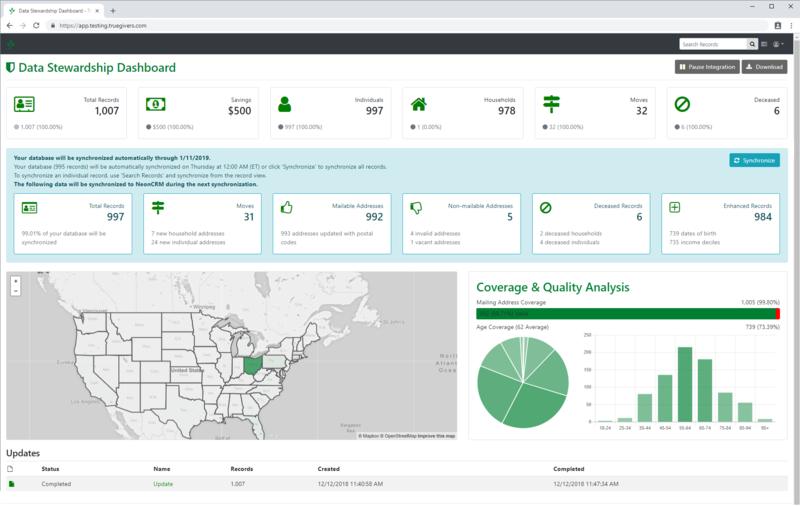 Dashboard Cards: Located at the top of the dashboard, these cards provide a count of total records, estimated marketing savings when you use TrueGivers data, and counts for various types of records. Next Steps Messaging: The blue box on the dashboard communicates what processes TrueGivers is working on and helps you understand your next steps. Choropleth Map: Visualize the geographic distribution of records in your database. Click on a state to see the count of records in your database with an address in that state. Coverage & Quality Analysis: A series of graphs show the count and percentage of records with specific attribute coverage. At launch we feature mailing address coverage, age coverage, and deceased analysis. Update Summary: Located at the bottom of your dashboard, the Update Summary shows details about the most recent data processing. TrueGivers processes your data daily. We call the the data a update. The update display page provides summary information of the update, and includes an Input Data Report and a Mailing Address Report. Input Data Report: a summary of data and data quality before TrueGivers started the daily process. Mailing Address Report: a summary of address data focused on how many records in your database have a mailable address. TrueGivers' update display page has an Input Data Report and a Mailing Addresses Report. 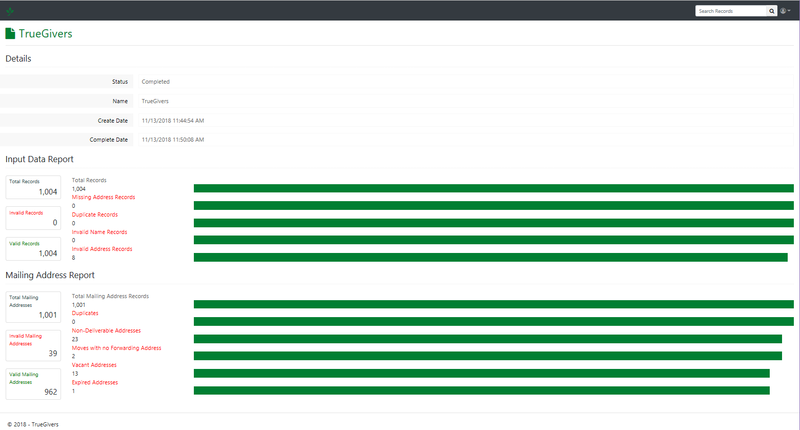 Use the search bar in the upper right-hand corner of the dashboard to search for individual records and see their data. You can search using First Name, Last Name, or a CRM record id. When you search for a record and click to view details, you'r looking at the record display. This reports the data we downloaded from your CRM (original column) as well as the updates we identified (updated column). Data in the updated column is what will appear in your CRM after synchronizing. There are three actions you can take on this page. 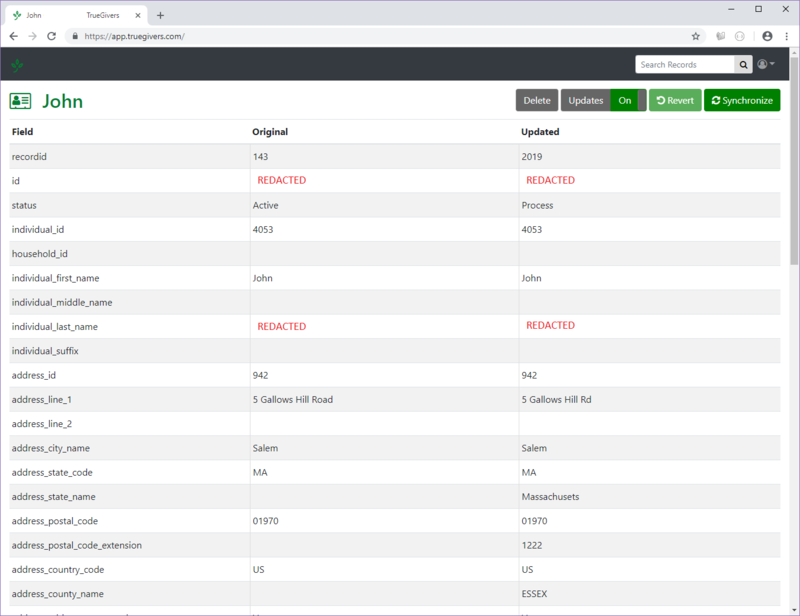 Synchronize Single Record: Use the Synchronize button on the record display page to synchronize the data for that single record with your CRM. This pushes new and standardized data into your CRM. Revert Single Record: Use the Revert button on the record display page to revert the data for that single record. This removes the data added to your CRM during synchronization, and returns the record to what it looked like before TrueGivers downloaded it. Turn Updates Off: Use this button to turn updates off for a single record. TrueGivers will no longer process the record to look for new updates or synchronize new data with the record. Record display shows original data and updated data that will be synchronized with your database. TrueGivers synchronizes with your CRM nightly. However, if you are excited to get new data into your CRM more quickly, the Synchronize button in the next steps messaging will kick off synchronization for every record in your database. This process is automated to run overnight, so you never have to click this button. It's just a way to get your updates even faster. Clicking this button will begin synchronizing your records, and all records in your database will be synchronized.